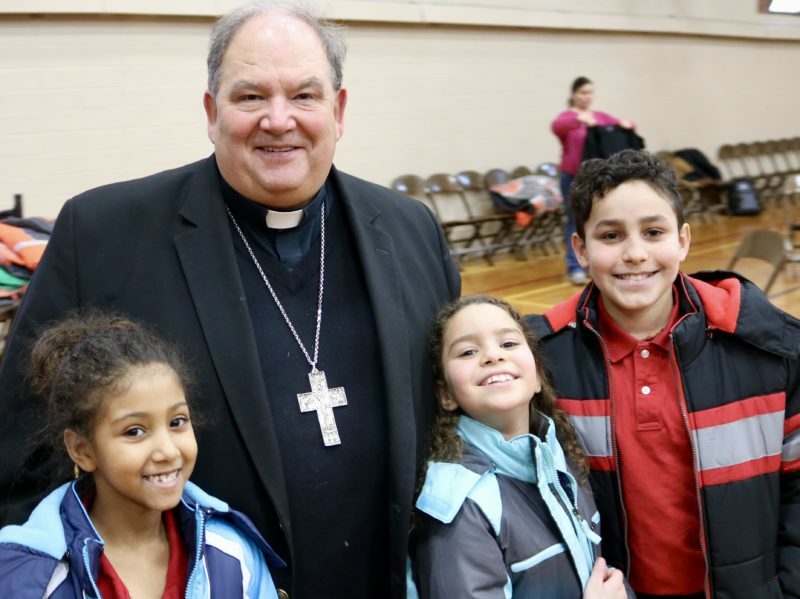 Archbishop Hebda visited our school along with the Knights of Columbus, who provided new warm winter jackets for all of our scholars. Tuition and fees account for only 7 percent of our revenue. The majority comes to us through the generosity of individuals and family foundations. It is set at $2,550, but families pay an average of $500, which is all they can afford. One school family pays full tuition plus gives a full scholarship for another scholar. Our actual direct cost of educating each child is $7,000; adding JPII’s share of central office expenses brings our cost to $11,000. 88% of our scholars qualify for free or reduced-price lunch.A family of four qualifies for free meals if its annual income is less than $31,980, a level set by the federal government. They contribute 26% of our revenue. This includes subsidies from the Catholic Services Appeal Foundation and gifts from Our Lady of Grace School. We get 60% of our revenue from individuals. Our annual Gala brings in around $200,000. Are you interested in making a gift and want to learn more about our school? Your generosity fuels the transformational education we provide.